Oakland parent Mischelle Bunton's son Tyren went to Lafayette Elementary School, in West Oakland, for several years before she found out the school had 0 percent of its students reading at grade level. She said she was stunned. "I was like, 'Oh no, I need to do something for my baby,'" she said. "It's not a good-quality school." Bunton got involved with a parent empowerment group called The Oakland Reach and with their help she applied and got her son into a better-performing school, Glenview. Oakland Reach founder Lakisha Young takes it personally that so many of Oakland's students of color are segregated in the district's lowest-performing schools, and she wants other parents, like Bunton, to feel that same outrage. That is why Young marshaled 83 black and Latino parents last month to the Allendale Community Center off 35th Avenue in Oakland's Fruitvale neighborhood. The event was well ahead of the district's open enrollment launch for school year 2019-20, but Young is concerned parents she is trying to reach sometimes are not aware of the importance of applying early, which she says is critical. There was food and childcare in one room while parents gathered separately so they could focus on the message. 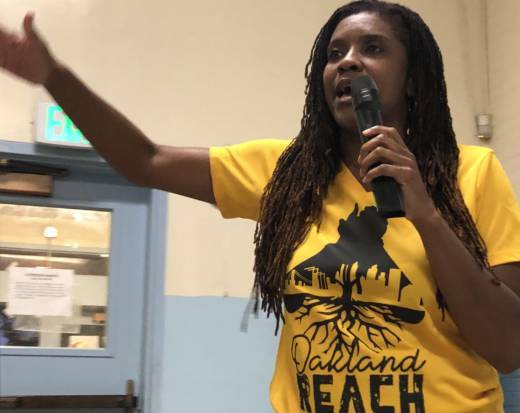 Young began by quizzing her audience about how well Oakland's black and Latino students do compared to white students: "Did you guys know that in OUSD black and brown students make up 70 percent of all students? That's a lot, right? But black and Latino students are half as likely to meet English language arts standards and one-third as likely to meet math standards. I don't know about you, but I have some feelings about that." Her audience nodded and called out in agreement. Young asked them to study a slide of district data. "Let's look at math," she said. "Wow! What do we have going on in math? Eighteen percent of black and Latino students are on grade level in math, what about our white students in math?" A few in the audience responded: "Sixty-six percent!" Young built to her point: "So somebody getting some money but our kids not served well. I want to be clear, that is why we are in this room today!" Young's goal is to get parents in low-performing schools to put pressure on the district to improve their schools or allow their children to attend the district's better schools. For her that means preparing her parents for open enrollment, which started Monday and ends next Feb. 8. "Raise your hand if your dream is for your kid to go to college," Young said. Hands shot up. "But we have kids who are performing at 18 percent of grade level," she said. "Is that going to work? No. So there's a gap between where you want to go and where we are." Young emphasized that there's tough competition to get into Oakland's high-demand schools. She tells parents they need to apply early, in the first enrollment round. "If you are not doing that early in the first round, you can forget it," she warns. District enrollment officials came to the meeting to explain how to apply and go over the deadlines. Enrollment chief Charles Wilson told the group that this year, for the first time, parents will learn whether they got into charters or traditional public schools on the same day, making it less confusing for parents to weigh their options and decide where they want their kids to go. And officials are touting their enrollment website EnrollOak. Wilson also doubled down on Young's message: that applying in the first round is the crucial to getting into a better school. Wilson said 68 percent of parents who apply on time to get outside of their local neighborhood school get their first or second choice. He said typically, parents who apply in the first round are a subgroup of more affluent families. Once the first enrollment application in February passes, Wilson says parents can still apply to get out of a low-performing neighborhood school, but the odds are much lower of finding a space open in the top-performing schools. Wilson adds that each year some 6,000 parents don't show up at the district until July and August, trying to get their kids enrolled. Oakland Reach wants to change that equation. In a new pilot effort, it's offering one-on-one counseling and school tours to help parents who want to get their kids into higher-performing schools.